You may have spotted on twitter, that I am coaching our companies Rugby League 9s team for the Corporate 9s competition here in Port Moresby. Technically, it didn’t really start out as coaching, more like Derrick nominating me to be there. 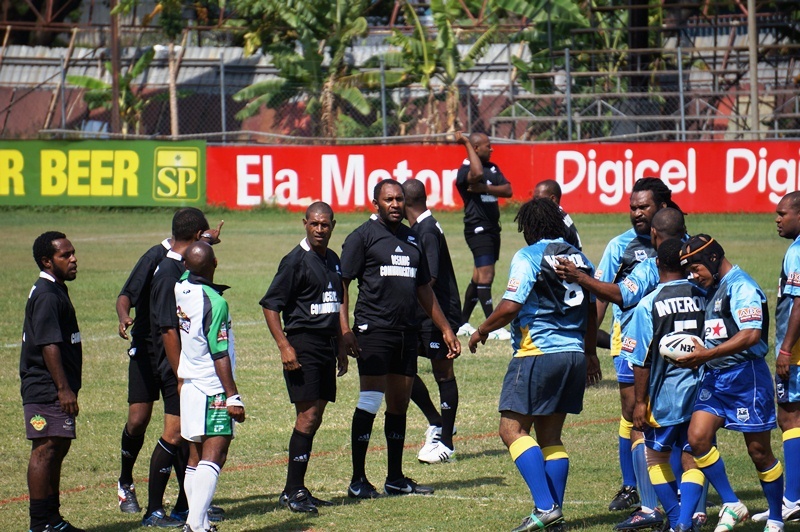 Our resident Digicel Cup star Toua Kohu was really meant to be doing the coaching with me (as the resident couch-ref) throwing in my two toea. As it turns out, Toua has been busy, #2 trainer Nou has been busy – he flits in and out, #3 trainer Boge has gone to a conference, and so I have been attempting to run drills and come up with plays and strategies. Last night, my strategy was “get them going – then play catch with some young kids from Kone” – lol. hehehe – it might have seemed that way, but honest, I was keeping an eye on everything happening on the field (if you can call the dustbowl, complete with rocks, glass, bits of metal etc – a field), and got the team doing some drills. My biggest problem, is I can visualise what I need to get them to do – but since I haven’t played in such a long time, showing them how to do it is problematic. Like, I called for two lines at each end of the marked out area – I got two lines – one behind the other. I really wanted a row, maybe I need to speak excel: “two columns, two rows”. I dunno. The guys look at me, they must be thinking – what the bloody hell is the kiwi up to? So last night I ran two rows passing drills, both with balls, running towards each other. They needed to be able to stop the gap between the opposing players running towards them, time the pass so it didn’t hit the opposing players, and get through all the hands, as well as not hit ball to ball. Spin around and do it again and again and again. I am not sure if they were bored or not, but I was trying to create awareness and communication – something we lacked on Sunday. Meanwhile, Xavier had befriended the bunch of kids from Kone, and he was running passing drills with them – bloody hell, good kid. Another run on Thursday – and then it’s final throw of the dice this Saturday against the team from Digicel. Win, and we are through to the finals, lose – and we go home with nothing. Only in PNG would this happen, we were all calling out for a Haka from the sidelines, I think they figured out a kiwi was there 🙂 As it stands, the NZRFU shouldn’t get too precious, these boys can only afford the 50kina All Blacks jerseys – and they wore them with pride. There isn’t much selection for a team to get gear, and to have a jersey made up locally costs around K250 – a weeks wages for some of these boys. There is lots of All Blacks jerseys here though (yes Chinese knockoffs) as everyone in PNG loves the AB’s. I know, I know…. I’ve been so busy here at work that I haven’t had the energy to blog. 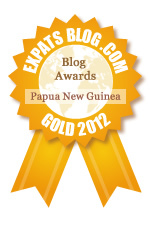 I think that can be a bit of an eye-opener for new expats into PNG – you work bloody hard! Well, at least – I know I do… And with the social calendar chock full – the writing time takes a hit. So – without further ado, here is a VERY fast update about what the hell we’ve been up to over the past month or so. We also had Jacinta’s birthday and Xanthe’s birthday in October – so it was a bloody busy month. Loloata Island: I took Jacinta and the kids out to Loloata for Jacinta’s birthday. It was awesome, we swam, snorkelled, ate, relaxed and really had a great time. Yes, it seems expensive to go – but worth every penny (or kina). We are going to make a much bigger effort to go out more often in 2014. It was just a day trip, but so much fun – and some fantastic photos that I will upload soonish. LNG Site: We took a drive out to the LNG site – apparently you shouldn’t drive this road alone, but I didn’t have any issues, and we followed other cars. I tell you, it is MASSIVE! And a great wee drive in the countryside… They even have a golf course onsite, doesn’t look like there is any croc’s though (unlike the POM golf course). recently: Port Moresby Corporate Rugby League 9’s. I got roped into coaching the companies 9’s team, and if you know me well, you will know that not only am I the world loudest couch-ref, I am also ultra-competitive, and love my league. So I am really enjoying the challenge and environment working with some of the guys not just in the IT team. We had our first two games on Sunday, and after winning the first 4-0 we went down in the 2nd 4-8. We’ve only had two training runs as we were a late addition to the competition (they have already had a round) and hence had to play a catchup game. The boys went really well, and I am sure we will be in line for another crack this weekend. Boat sinking: Whilst we were out playing footy, Billy (one of my team) was out in his dingy (banana boat) in a village fishing comp. 20 km’s out from land, they submarined the dingy and sunk it. With 6 on board, they were very lucky that they were able to wave a bright coloured t-shirt and make a short mayday call on a cellphone before the phone got wet. Billy said the dingy went under in about 4 seconds!! After bobbing around in the water for an hour (with no safety gear) they were rescued by other competitors. A couple of months ago – they lost some boys at the exact same spot – it’s a trench with a fast current between some reef’s. So, Billy, his dad and nephews etc – were BLOODY LUCKY!!! If anyone from Hulchwilco is reading my blog, I’d love to see you guys sponsor a few of these. Papua New Guinean’s live in the sea, but can’t really afford all the safety gear that we just take for granted in NZ.